A Humana Prior Prescription (Rx) Authorization Form is required when additional information is needed to determine financial coverage of specific prescription medication. In each of the below linked documents, all fields will need to be filled to enable the insurance company do establish whether or not there is sufficient evidence to justify coverage for the patient in question. As an alternative to filling out a PDF and submitting the completed form via fax, Humana has used CoverMyMeds to allow patients to request prior authorization online (link below). Unless the patient resides in Texas, Colorado, or California, or if they are a Medicare member, the general prior authorization form can be administered. Step 1 – Download the appropriate form from the list above. 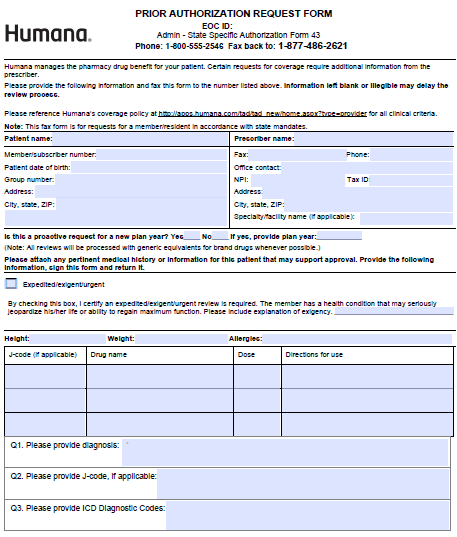 For the purposes of this tutorial, we’ve detailed how to complete the general Prior Authorization Request Form below. Step 3 – If this is a proactive request for a new plan year, check “Yes” and provide the plan year. If not, select “No.” Check the applicable box if the request is urgent and supply explanation. Be sure to also attach any pertinent medical info that may enable Humana to determine coverage. Step 4 – The patient’s height, weight, and allergies will be required here. In the table below, supply the drug name, dose, and directions for use of each requested drug must be listed along with the J-code (if applicable). Below this, in “Q1,” enter the diagnosis. “Q2” requires the applicable J-code, and “Q3” requires the ICD diagnostic codes. Step 6 – The following three questions ask for a list of all therapeutic alternatives previously used, all relevant lab values related to medical condition and, if the request is for duplicate therapy, information and rationale for noncomitant use of the medications. Step 7 – The final four fields allow you to provide the dosing rationale, the patient’s complete current medication list, any pertinent information related to the diagnosis, and any additional info that would benefit the review. Step 8– At the bottom of the form, provide your signature and the date before sending the completed document to Humana for review.